With the rise of extreme weather events worldwide--witness the devastation wrought by Hurricanes Sandy, Irene, and Katrina, and the sustained drought across the American West--global warming has become increasingly difficult to deny. What is happening to our planet? And what can we do about it? The Global Warming Reader provides more than thirty-five answers to these burning questions, from more than one hundred years of engagement with the topic. 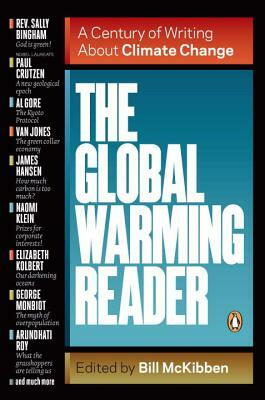 Here is Elizabeth Kolbert's groundbreaking essay "The Darkening Sea," Michael Crichton's skeptical view of climate change, George Monbiot's biting indictment of those who are really using up the planet's resources, NASA scientist James Hansen's testimony before the U.S. Congress, and clarion calls for action by Al Gore, Arundhati Roy, Naomi Klein, Van Jones, and many others. The Global Warming Reader is a comprehensive resource, expertly edited by someone who lives and breathes this defining issue of our time. Bill McKibben is the New York Times bestselling author of numerous books, including The End of Nature, Deep Economy, Eaarth, and Falter. A founder of the environmental organization 350.org, he was among the first to have warned of the dangers of global warming. He is the Schumann Distinguished Scholar in Environmental Studies at Middlebury College and the winner of the Gandhi Prize, the Thomas Merton Prize, and the Right Livelihood Prize. He lives in Vermont.